Culture, archeology, beaches, relaxing and lots of fun are what you’ll find in your next summer in Cancun. Learn more about all-inclusive packages and amazing plans for your visit to the Mexican Caribbean. The Mexican Caribbean is internationally known for the beaches and ambiance of Cancun and surroundings. If you’re planning to travel to one of these destinations, we share with you some options of packages that will interest you. There are a lot of travel agencies or airlines with interesting discounts to travel to Cancun. Tip: plan your trip during low season and you’ll find better prices and have a better experience visiting some touristic points, since you won’t find a lot of people. When is low Season in Cancun? The low season in Cancun is from August to November, every year. The best part is that the weather is better in those months! Traveling to Cancun and not enjoy all the things you can do there is a tremendous waste! You will always have a great variety of activities and find some adequate for everyone’s taste! For example, Cancun has the most amazing aquatic parks in the world. You can’t visit this destination and miss the opportunity of going to at least one of them to swim with dolphins, explore underground rivers and more! With this all-inclusive package in Xcaret, you will enjoy the best of this ecological park: swim with dolphins, cultural shows and a lot of adventure! What’s included? You must get one of these all-inclusive packages for your next vacations in Cancun. However, if you don’t want to go out of the city, you can visit the Interactive Aquarium in Cancun, where you can learn a lot of the marine world and experience an underwater walk with the Sea Trek equipment. Can you imagine it? These all-inclusive packages are perfect for having fun in Cancun. 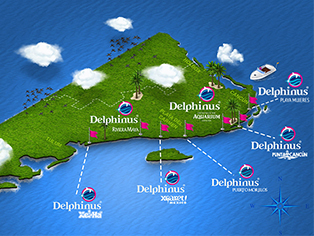 Travel, discover the Caribbean nature, swim with dolphins and learn more about the world around us!